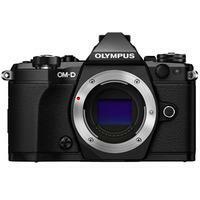 The Olympus OM-D E-M5 Mark II is built around a 16-megapixel 4/3 LIVE MOS sensor and the company's most powerful 5-axis in-body Image Stabilisation system yet, to deliver blur-free stills and stable video footage at all times. The E-M5 MK II is capable of delivering 40-megapixel images using a new composite option that uses clever sensor shift technology for when the highest level of detail is required in your stills, whilst the new Movie Mode offers 1080p Full HD movie recording in a variety of frame rates - 60p, 50p, 30p, 25p, or 24p. Highly portable and weather-resistant, the camera features a magnesium-alloy body with classic OM retro-styling, manual control and a 3.0" touchscreen that's tiltable 180°.